Beltline Cafe is Aquin's Foodservice provider for daily lunches at both campuses, some concession items during high school football, and special events held throughout the year. Our system at the high school operates on an 'ala carte' menu. Main entrees are posted in the cafeteria. Students will pay for their meals—or items--as they go through the line during their lunch period. The St. Joe’s Lunch Order Process consists of a paper forms sent home in the 'Brown Envelope on every other Wednesday. Completed forms with payment must be returned to the St. Joe’s Office the following Friday. Paper order forms for lunch at St. Joe’s Campus will go home every other Wednesday in each family’s 'Brown Envelope'. One order form per student will be sent home. Each family is responsible for completing 1 paper order form per student if lunch is ordered. When completed, the form and payment will be sent back to the St. Joseph office in the family’s 'Brown Envelope'. 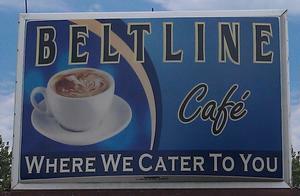 Checks must be made payable to ‘Beltline Cafe’. Lunch order payments for multiple students in one family may be combined, but ‘missed lunch’ payments must be made separately. ‘Missed lunch’ payments must be sent in the notice envelope that is sent home. 'Snow Day' lunches or 'Sick Day' lunches will not be refunded. If your student is absent on a day that you have ordered lunch, you are encouraged to come to school and pick up your 'paid' lunch. Thank you in advance for your cooperation and understanding. It is greatly appreciated. If you'd like to make suggestions for the menu choices at either campus, give an idea for making things run smoother, or just say 'hi'--click here and access the Beltline's Facebook page. You do have to be a member to post on their page. We have an 'Aquin' email set-up for the Beltline staff. It is 'food.service@aquinschools.org'. They will check it daily so you can communicate this way as well. Please don't call the St. Joseph office for Food Service questions.